Erasmus+ is open to many individuals and organizations, although eligibility varies from one action to another and from one country to another. 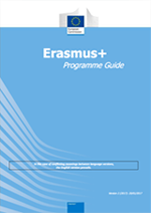 Individuals can take part in many of the opportunities funded by Erasmus+, although most will have to do so through an organization taking part in the programme. The eligibility of individuals and organizations depends on the country in which they are based. As a general rule, participants in Erasmus+ projects must be established in a Programme Country. Some Actions, notably in the fields of higher education and youth, are also open to participants from Partner Countries. The specific conditions for participating in an Erasmus+ project depend on the type of Action concerned. For projects relevant for the field of higher education, the main targets are: higher education students (short cycle, first, second or third cycle), higher education teachers and professors, academic and administrative staff of higher education institutions, trainers and professionals in enterprises.